A so appreciable production entity surprising in size or organization, a staff of skilled experts who faces building a yacht as if it were a mission, a very actual quality indeed, whose skills and eye is not to be doubt and who is not so used to be under the spotlight. This is the first good impression received while visiting the F.lli Rossi yard, a firm working in Versilia in both two offices: one of them in Viareggio and the other one right round the corner of Pisa. What's about its specialization? 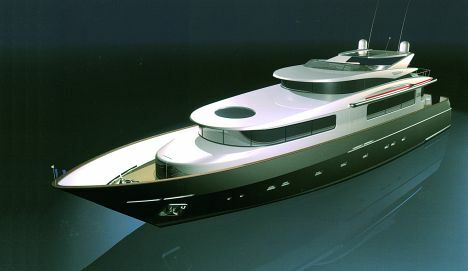 Of course building steel or light alloy superyachts either for its own customers or mostly for very blazoned yards who choose to entrust their designs to the F.lli Rossi's yard above all else for the quality this team can give to each single unit produced. 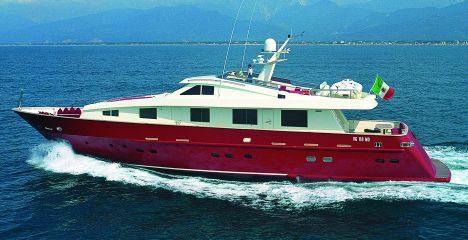 The firm was born in the '70 years in Viareggio and has years on years specialized in shipbuilding. To this period date back the first steel buildings on third parties' behalf and realizing crafts addressed to siliceous sand digging in the Massaciuccoli district. In the '80s years, after a long experience in building units exclusively addressed to the inland navigation, the F.lli Rossi yard improved its skill in treating traditional and high strength steels, light alloys and stainless steels thanks to which this yard could begin building steel hulls with fibreglass superstructures as well as realizing merchant vessels for either coastal or internal navigation. So the venture between the F.lli Rossi society and the most prestigious yards began building yachts that let this entity extend its great skill to the leisure craft field too. In this period the F.lli Rossi yard built important crafts like the motor ship "Freccia del Giglio" the light alloy "Andrei 2000" moved by an hybrid propulsion system, the passenger vessel "Lini Beccati" and some catamarans, among which the "Freccia del Giglio II" stands out. Beginning from the?90s years the yard in Viareggio started working at four new production segments specializing in treating stainless steels, in building superyachts, in putting together mechanical components and hydraulic installations as well as in working in either repair or refitting sectors. Following these new improvements the yard set up a working collaboration with Azimut concerning machinery, components and installation outfittings on board fibreglass yachts over 24 metres in length. Still in this period, in order to give more space to the noticeable yard's activities, the F.lli Rossi company bought a shed of 800 sq/m with a forecourt of 500 sq/m lying in the industrial area of Viareggio, an office in the Italmaco Centre, become its financial and entertaining office today, a concession at the wet dock of the Canale dei Navicelli, provided with an enclosed area of 7.000 sq/m and a quay of 300 metres in length, where yachts up to 62 metres in length are actually built. Today this yard can boast about wholly building of more than 12 steel yachts ranging between 24 and 45 metres, of 12 units in fibreglass, of quite a number of 60 hulls and superstructures from 20 up to 70 metres and eight fully refitted yachts. The yard wants to assert it has no intention to sit on itself ãlaurels, but, instead, it purposes to go on pursuing itselves aims, namely its hard politics, power and professionalism, correctness of its working, which together with constant researching refining over the years and the last investments in infrastructures will lead the firm to improve further innovations; however, the yard is strengthening as one of the most appreciated entity working in the superyachts building field.